This May, we are celebrating #MedMonth by providing resources and tips on the Mediterranean Diet. Although most of the resources involve healthy eating, a big part of the Mediterranean lifestyle is physical activity. It is recommended to be moderately active (e.g. brisk walking) at least 150 minutes per week, which breaks down to 30 minutes per day. Since employees spend a majority of their day at the office, and most of the time at the office involves sitting, it is important to encourage them to move more throughout their day and provide opportunities for physical activity. Providing physical activity opportunities can be done by encouraging employees to adopt periodic stretching breaks, desk exercises, to take the stairs instead of the elevator, and to walk to a colleague instead of sending an email. The best way to do this on a regular basis is to set a timer or calendar reminders to stand up and stretch or move once an hour. This has been proven to be effective through the Pomodoro Effect, which has demonstrated that taking short breaks can improve employee performance. Although very effective, it takes an employee’s individual motivation and discipline to incorporate these frequent movements. So in addition to these daily movements, how do we reach employees on a broader scale to encourage physical activity? Consider physical activity opportunities that involve all staff members and employees. Below are 5 ways to do just that. Create a walking challenge. Walking challenges create a little competition between employees while allowing them to work together to reach similar goals. 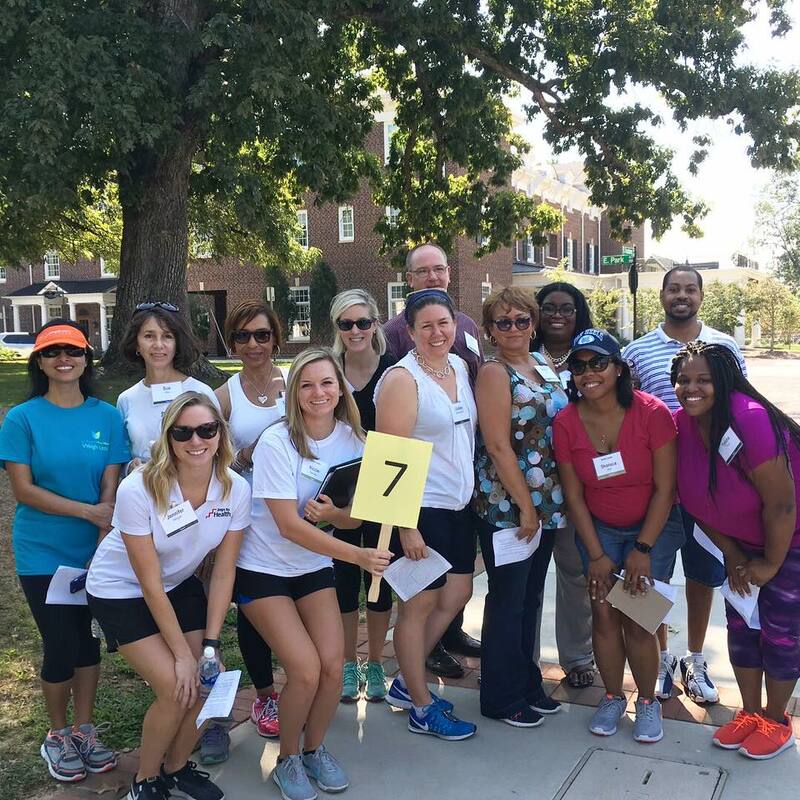 Walking challenges also encourage team building and social connections between employees, especially team walking challenges. Encourage physical activity breaks during meetings. Keep employees engaged during long meetings by offing a five-minute physical activity break. This could be a simple stand-up and stretch break, a lap around the office break, or a YouTube-led break. Get your employees involved by assigning a designated activity break leader for each meeting. Coordinate a weekly walking routine. Create a weekly walk to be held at the same time and the same place each week. For example, a “Tuesday Trek at 10am”. Each Tuesday, employees know they can meet at 10am at the designated location for the 15 minute walk. Send reminder emails and calendar invites to keep employees motivated and appoint coordinators to lead the weekly walks. Offer on-site exercise classes such as Zumba or Yoga. Coordinate on-site physical activity classes all employees can enjoy, whether it’s once-a-month yoga or weekly Zumba classes. Determine a common place and time for employees (lunch time or after work hours), and consider holding the class outside if the weather is nice. Provide alternative desks. Offer alternative desk or chair options for employees to stay active throughout their day. For example, standing desks or treadmill desks are a great way to keep employees from sitting for too long. Even just offering one treadmill desk for the office for employees to use when needed will help encourage them to move more. Another alternative desk idea is to provide exercise balls for employees to use as chairs. These can be used for the whole day or for a few hours each day to help strengthen their core. Consider a “check-out” station for employees to grab one as needed. Of course, every group of employees is different and every office campus is different. Tailor the above suggestions to fit your particular group, adapting and adding new ideas as they pop up. Listen to your employees and consider sending out a survey to gauge their interest in wellness activities. What type of exercise classes would they be interested in? What time of day works best? You can then form your plan based on their feedback.